(NaturalNews) As our editor-in-chief, Mike Adams, the Health Ranger, reported recently, consumer advocate Vani Hari -- better known to many Americans as the "Food Babe," won yet another victory in her fight on your behalf for clean, fresh food. In an announcement on her website, Hari said she had managed to convince the Subway restaurant chain, a huge corporation, to adopt a practice in the U.S. that the company had already adopted overseas -- end the use of breads containing a chemical used in the manufacture of yoga mats and shoe soles (you can see her campaign here). The chemical, azodicarbonamide, has been approved by the FDA and the USDA, though the chemical has been linked to cancer. It is currently included in all of Subway's most popular sandwich breads served in the United States, including its 9-grain wheat and honey oat, Italian white and Italian herbs and cheese, among others. As Hari points out, Subway does not use breads containing azodicarbonamide in restaurants in the United Kingdom, throughout the European Union, in Australia and elsewhere. But what Natural News readers need to know is that Subway is far from the only American food chain to do so. In fact, you're going to be surprised to find out just how widespread the use of this chemical really is. 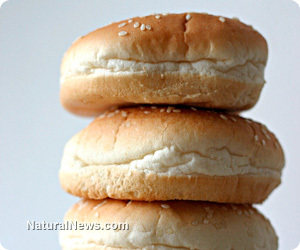 -- McDonald's uses the chemical in its bakery-style buns, English muffins, Big Mac bun and also in its sesame seed buns. -- Not to be outdone, Burger King includes azodicarbonamide in a host of its foods: the artisan-style bun, English muffins, French toast sticks, croissants, sesame seed buns and home-style Caesar croutons. -- Dunkin Donuts puts the chemical in its croissants, Texas toast and Danishes. However, the company may have had a change of heart. A company official told CNBC recently: "We are evaluating the use of the ingredient as a dough conditioner in our products and currently discussing the matter with our suppliers." -- The little red-haired Wendy's girl may be cute, but the company nonetheless uses the chemical in their premium toasted buns, bagels, Panini bread and sandwich buns. -- Roast beef chain Arby's is guilty as well, including azodicarbonamide in its sesame seed buns, onion bread, harvest wheat and honey wheat breads, French toast sticks and croissants. -- More leaps out at you at Jack in the Box than an odd-looking clown character. This chain uses the chemical in its regular buns, jumbo buns, bakery-style buns and grilled sourdough bread. -- Carl's Jr. includes the chemical in its French Toast Dips, honey wheat bread, sourdough bread and its plain and sesame seed buns. -- Following in the footsteps of the other restaurant chains, Hardee's buns also include the chemical. Specifically, it is an ingredient in the chain's sourdough bread, hot dog buns, wheat buns, croissants and seeded buns. -- Last but not least, if Harold and Kumar had only realized that White Castle buns -- along with the chain's French Toast Sticks, Cloverhill Cheese Danish, Cloverhill Big Texas Cinnamon Danish and Awrey Grande Cinnamon Swirl -- also contain the chemical. One chain -- McDonald's -- defended use of the chemical as an ingredient in its buns. "Azodicarbonamide is commonly used throughout the baked goods industry, and this includes some of the bread goods on our menu," spokeswoman Lisa McComb told CNBC. She also mentioned the fact that the chemical is government-approved, adding the platitude that McDonald's would continue serving "the great tasting, quality food" that customers "expect" from the chain. She did not, however, address why the U.S. government would sanction its use despite being banned in Europe, and how the chains still profit overseas using azodicarbonamide-free breads.